Home » Uncategorized » The Bourbon Mafia Takes Over Chicago! 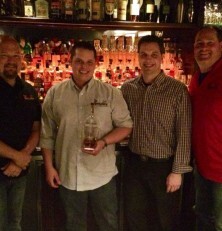 The Bourbon Mafia Takes Over Chicago! Whisky Advocate’s annual ‘WhiskyFest Chicago’ was held on Friday, April 25, 2014, at the Hyatt Regency in Downtown Chicago, and you can be assured that several members of The Bourbon Mafia were there in full force! It was hard to miss us in our Bourbon Mafia gear. Although WhiskyFest itself is a one evening event, there were plenty of activities before and after that allowed you to wet your palate with some of the finest bourbons, whiskies, and malts from around the world. The whiskey festivities for The Mafia started on Wednesday night with an Angel’s Envy tasting and bottle raffle at Old Fifth on West Madison. Old Fifth specializes in Whiskey, Pizza, and Social Fare. Their whiskey and bourbon selections are impressive, the menu is very appealing, and the atmosphere is very inviting. Charles Hetzel and Brain Gelfo attended the event, hosted by our very own Kyle Henderson of Angel’s Envy. There were a bunch of big screen TVs all around to enjoy the NBA and NHL playoffs while sampling their Angel’s Envy flights. A great time was had by all, and we can assure you that there was no funny business when Charles won the raffle and received a complete set of Angel’s Envy products including the original, the rye, and of course the 2013 Cask Strength! All are available for tasting at Charles’ home bar Braxton Cellars if you’re ever in Chicago. After the Old Fifth event, Kyle headed over to the Sedgwick Stop for a demonstration of the Angel’s Envy blending program while Charles and Brain headed over to The Office @ The Aviary to meet up with one of the newest Mafia members, Micah Melton. The Office is an intimate, elite speakeasy that seats a maximum of 20 people, located in the basement of The Aviary bar. Gaining access to The Office usually requires a persistent attitude and a little luck…or a Mafia member that is a regular customer and another that is on staff! Micah is the Sous Chef/Bartender for The Aviary / The Office. The whiskey cocktails at The Office are second-to-none and Charles and Brian enjoyed some gourmet Manhattans before Kyle rejoined them for some cocktail sampling. The good times continued as the Mafia members got to know each other a little better while absorbing the incredible offerings and atmosphere of The Office. We even ran into some of the world’s elite brewmasters including The Evil Twin himself Jeppe Jarnit-Bjergsø from Denmark. Wednesday night was going to be tough to beat, but the events from Thursday were up to the task. The night kicked off with Binny’s World of Whiskies at their Lincoln Park downtown location. This Binny’s is a 55,000 square foot beer, wine, liquor and food emporium catering to the whiskey enthusiast. More than 60 distillers offered samples of more than 200 whiskies, bourbons, and malts for over 2,000 people in attendance. While in line, Brain and Charles ran into Kerrie Blazek and Hillary Lake – the duo behind the popular Twisted Whiskey Sister online Whiskey reviews. Hillary is also proprietor of The Sedgewick Stop a bourbon bar in Chicago. Kyle was working the event to promote his great products, but Charles and Brain attended as patrons to enjoy everything there was to offer. Fellow Mafia member Tom Helt, and his wife, joined Charles and Brain for the fun at Binny’s. They all enjoyed some great spirits while meeting some of the powerhouse members of the whiskey industry. As a special treat, four craft distillers (Few, Corsair, Mississippi River, and Journeymen) collaborated on a 2014 Binny’s only special release dubbed Four Kings. This blending of their bourbons was a true delight and one of the best samplings of the night. Although production was limited to 720 bottles, the Mafia was sure to get a few signed bottles for safekeeping. After a few hours at Binny’s, the festivities shifted to a VIP party at Untitled. Untitled pays homage to the vibrancy of supper club and speakeasy establishments of the Prohibition Era. There were multiple rooms and levels to continue the met-and-greet that started at Binny’s. A few of the distillers setup shop at Untitled and continued to share their great spirits with the crowd. The vibrant atmosphere, catchy music, great-looking crowd and assortment of libations made this a great way to wind down the evening. However, the Mafia members were not done yet and decided cap off the night with a little Mexican cuisine at Mercadito and we were joined by many members of the Bourbon Trail including Jimmy Russell. As Friday came, Charles and Brain were ramped up for WhiskyFest. Before the event though, they cruised over to Antioch Fine Wine and Spirits to meet friend and fellow Bourbon Enthusiast and proprietor Adam Kosh and have a few samples of his Angel’s Envy blend and Four Roses barrel selection. If you are ever in the area, be sure to stop by and meet the friendly staff at Antioch while you peruse through their impressive whiskey selection. After this impromptu tasting, it was time to head downtown for the highlight of the week where we toured the WhiskeyFest with Adam Kosh and friends. Redbreast – 21-Year and several others! After the VIP hour, Charles and our friends from Antioch joined into the festivities and had an opportunity to sample more than 300 whiskies and brews from more than 80 distilleries and breweries. On top of that, there was an impressive buffet to make sure that everyone had plenty of food to soak up the alcohol! Again, many of the power brokers from the industry went out of their way to make sure that everyone was welcomed and got all of their questions answered. This was truly an amazing experience that any whiskey lover should plan to attend at least once, but preferably yearly! To close out the WhiskyFest festivities, the official after party was held at Delilah’s on Lincoln Ave in downtown Chicago. Delilah’s, legendary punk bar, is known for their incredible whisky selection, and added their 666th different whiskey to the menu just in time for Whisky Fest. Mike Miller, the owner of Delilah’s was a gracious host while running around making sure everyone was well taken care of. Charles and Brain enjoyed some great craft beers and a whiskey or two to close out three tremendous days of fun and spirits! Throughout the three days of festivities surrounding Whisky Fest, the Mafia members in attendance spread the word about what makes this group different than all other whiskey groups. The interest in the group was almost overwhelming. Charles, Brian, Kyle, Micah, and Tom had a great time making new friends and sampling new things. The hope is that WhiskyFest Chicago (or maybe even San Francisco or New York) becomes a yearly gathering of Mafia members from around the country to spread the word, catch-up with old friends, make new friends, and of course sample the delicious brown water we love!